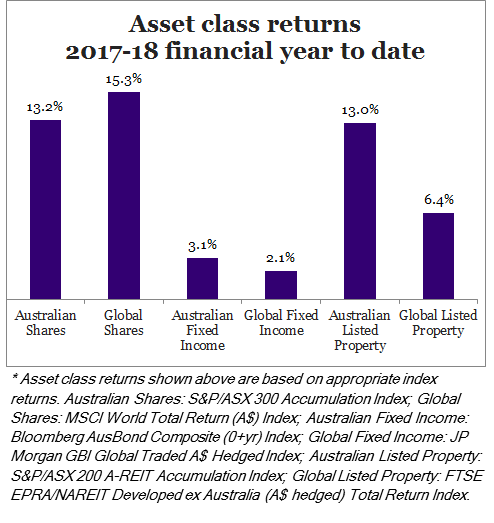 The 2017/18 financial year saw a return to more normalised conditions in global share markets. By ‘normal’ in this sense we refer to the levels of volatility and dispersion in stocks, sectors and countries that are historically more typical of markets. The post-GFC phase of ultra-low interest rates across the major economies came to a close and so began the process of structural adjustment from the ‘lower for longer’ disposition that has supported valuations for risk assets and kept sovereign bonds in the unloved basket. The task ahead for investors was to position portfolios for the inevitable unwinding of policy support and accurately predict the trajectory of interest rates and inflation. History has also shown that this is an imperfect science, fraught with variability. Adding to the uncertain course for markets were disruptions to the political landscape. Investors were considerably influenced by Trump tweets, the emergence of populist power and trade war rhetoric as well as the more structural shifts relating to US tax policies, energy prices and household balance sheets. Developments in these areas frequently dominated the news headlines and generally left investors uneasy. But the underlying stories provided for a more sanguine assessment of capital markets and an important reminder for investors to buy the fundamental story of the asset and apply an active and focused approach to selecting investments. The Australian share market certainly proved to be fertile ground for active decision makers. In aggregate, the market delivered a gain of 13.2% for the financial year, although there was considerable dispersion in the winners and losers at the stock and sector level. At the broadest level, Resources (+40.3%) considerably outpaced Industrials (+8.1%). The Materials sector (+29.9%) was a beneficiary of strengthening demand for bulk commodities such as iron ore. The Energy sector (+41.9%) was a standout performer, supported primarily by a 61% increase in the crude oil price. Such a rise proved fruitful for energy companies such as Santos (+106.9%) and Beach Petroleum (+217.1%) but acted as a tax on other companies, given the flow-on effects for input costs or consumer responses to discretionary spending. Big was not necessarily beautiful in 2017/18. Smaller companies (+24.4%) outperformed their large cap counterpart, in part reflective of the relatively high resources exposure. The prospect of tightening monetary conditions hampered the bond-sensitive sectors, which collectively rose by an uninspiring 0.7%. Within the Industrials segment, Health Care (+27.7%) outperformed, although in common with the divergence in performance across the market, fortunes were mixed. At one extreme was Sirtex Medical (+97.9%) which benefitted from a bidding war for the company between US-based Varian Medical Systems and China-based alternatives fund manager, CDH Investments. In contrast, the laggards in this sector were Monash IVF (-35.6%) and Impedimed (-47.7%). Also weighing on the industrials grouping were Telecommunication Services (-30.9%) and Financials ex-Property Trusts (+1.6%). Telstra was the major source of weakness for its sector, falling 34.4% on the back of its declining earnings growth and a cut to its dividend. Meanwhile, the major banks were dealt their fair share of challenges a Royal Commission, higher funding costs and regulatory imposts to name a few. ANZ Banking Group (+3.9%) was the pick of the big four banks, while Commonwealth Bank (-7.0%) was best avoided for banking exposure. The domestic listed property sector matched the performance of the broader share market in 2017/18. The sector benefitted from some supportive macro factors, primarily the pushing out of expectations for interest rate rises and a benign inflationary environment. In contrast to the dispersion theme across industry sectors, the property sectors exhibited considerably less deviation in performance. In aggregate, 33 out of the 34 A-REITs generated a positive return, with 23 of these being in excess of 10%. The big news influencing the sector was in retail land, with investors concerned about the impact of online competition. The exit of sector heavyweight, Westfield Group, following the takeover by European property giant Unibail Rodamco as part of a A$32b deal which completed at a substantial premium, saw around A$7b of cash proceeds out to find a new home. Across the sector, industrial property REIT, Property Link Group (34.4%) topped the table, while Stockland (-3.6%) dipped into negative territory. Global shares delivered a strong return for Australian investors, although a weaker Australian dollar limited the gain to 10% for investors that hedged the currency. US stocks continued to gather momentum against a favourable macroeconomic backdrop. Global markets suffered a temporary correction in February, triggered primarily by the latest US labour market data and fears of prospective inflation and uncertainties over Trump’s ‘policy on the run’ approach to resetting the global trade landscape. But where investors are concerned, America may already be great again – as indicated by the 14.4% total return from the S&P 500 Index in 2017/18. US corporates also responded favourably to President Trump’s corporate and personal tax cuts. This, coupled with a resilient economy that now boasts annual GDP growth of 2.8%, solid jobs growth and unemployment at a 48-year low of just 3.75%, provide meaningful justification for double-digit returns from US shares. These data points supported decisions by the US Federal Reserve (Fed) to progress its monetary unwind, raising the Fed Funds rate on three occasions over the course of our financial year. President Trump’s mantra on global trade led to ramifications for markets in Europe, the UK and Asia. The first in a series of tariff imposts against China came into effect in January, with ensuing measures levied on around US$50b worth of high tech and industrial imports from China. China’s own economy continued to grow, albeit at a declining rate of expansion as growth stabilised at a 6.8% annual rate. Shares listed on the mainland underperformed the Hong Kong bourse, while other emerging Asia markets were somewhat impacted by weakening sentiment from the trade rhetoric and higher oil prices. Japan continued to diverge in performance, delivering a return of 11.3%. European markets had their own share of challenges, ranging from political destabilisation and the European Central Bank (ECB) continuing to pursue a gradual unwinding of monetary stimulus, through to consternation over the shape and form of Brexit. Returns from the region were an uninspiring 4.3%, even less for investors in the share markets of Spain and Germany. It was a year of two halves for bond markets. Early in the period, further signs of growth taking hold in the major economies led to expectations of inflation returning in the near term, sending government bond yields higher. A change in the guard at the Fed was accompanied with the market’s notion that incoming Chair, Jerome Powell, would pursue an aggressive tightening agenda. This also coincided with the sell-off in equity markets and bonds also sold off, sending yields higher. The market has moderated fears since this time as the Fed progressed with its program of normalising interest rates. The European Central Bank (ECB) also progressed along a similar path of reducing stimulus, albeit at a more measured pace. In contrast, the Reserve Bank of Australia has retained its cash rate at 1.5% for a record length of time. A confluence of low wage growth, household indebtedness and benign inflation has kept the board from acting in concert with its global peers. The result was a very moderate return from fixed income. Global bonds returned 2.1%, while Australian bonds fared somewhat better with a 3.1% return. Credit spreads on Australian corporates tightened in the second half of 2017 alongside healthy risk appetite. This was driven by accommodative global central bank monetary policy settings, the much-anticipated US tax reform and better-than-expected reporting sessions out of the US and Europe. However, credit spreads subsequently reversed moves for the entire second half of 2017 in the first six months of 2018 as volatility increased on the back of fears over higher US inflation and geopolitical risks. Meanwhile, the Australian dollar weakened against the major counterparts over the year, down 3.7% against the US dollar, 5.9% against the euro and 5.2% against the British pound. The normalisation process for monetary policies across the globe will erode progressively the valuation support that unilaterally low risk-free rates have provided to growth assets. This changing environment should also increase the level of dispersion in returns both within and across asset classes as focus returns to fundamental rather than market momentum drivers. That said, the speed and nature of this adjustment is uncertain and further complicated by more esoteric forces like global trade, political brinkmanship and structural changes in the shape and composition of industries. Investors are likely to experience temporary bouts of volatility and greater dispersion between the performance of different asset classes, sectors, industries and companies over the next few years. Despite the uncertainties, this is very fertile ground for investors to take active, research based decisions on where and how to allocate capital. While some of the imbalances across markets may persist and warrant a degree of caution, we believe the greater risk would come from taking a set-and-forget approach to allocating capital. 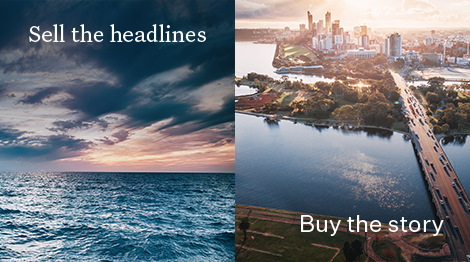 Pendal continues to apply its multi-faceted approach to generating excess returns by looking through the headline factors that regularly skew market valuations and risks. Our focus is maintained on ensuring investments are actively managed to reflect the underlying stories that are driving risks and returns. Investors should also maintain an allocation to the Alternatives sector within a multi-asset portfolio. Through an appropriate selection of strategies, this sector offers diversification benefits with the potential to enhance returns. Our Income & Fixed Interest team looks at the changing domestic economic landscape and highlights the importance of ESG considerations when investing.